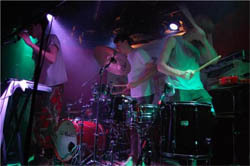 As a live band WhoMadeWho are an unforgettable, incendiary experience having played alongside genre bending contemporaries Daft Punk, Soulwax, Hot Chip and LCD Soundsystem. Brooklyn Vegan, always a good barometer of quality, said the following before putting them on at SXSW: "they were weird and awesome and won the initially-perplexed crowd over quickly. If you're going to SXSW, they're definitely a "don't miss" band." And we're got DKHDS DJing early for us too.